Data security, data exchange and collaboration are all about getting information to the right person at the right time in the right format. It seems simple enough, but most people don’t realize that electronic data exchange protocols were developed in the early 1970s. Working with a simple, convenient FTP or SMTP to send your data might seem like the best way, but with all of the recent data leaks, you might want to reevaluate: how safe is your data? When sending data, increased convenience should never compromise data security. Standalone “simple” portals between your company and your supplier or consumer are options, but an advanced portal that is integrated deeply into your employees systems and processes is recommended. Secure data exchange needs to start as close to the end user’s daily working environment as possible. 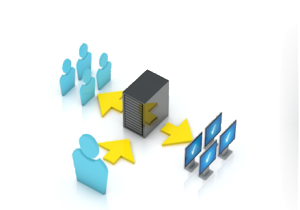 This includes desktop integration, email integration, PLM integration and integration into your purchasing or bid systems. It needs to be accessible from any place and any system. If your users have to leave their default working environment to provide data security, they are less likely to use the approved system. Find a solution that integrates into your workflows, but also has the highest level of data security. Data should always be encrypted before transport outside of the enterprise without forcing daily users to change their normal routine. Your solutions should also integrate into the end user’s desktop, creating drop zones that allow files to be automatically downloaded. On the back end, it should allow you to integrate and automate the back end systems for dealing with engineering data and create centralized reporting on confidential information being sent. It should also provides systematic and automatic processes to transform your data prior to exchange, to allow only the minimal information required for the recipient to do their job. Your data exchange portal should also creates “data profiles” that determine what each recipient can receive, and use Digital Rights Management to help you control your documents by limiting document features and access to users, revoking rights in the field, forcing updates to the latest document versions and creating traceability logs by document. Start looking today at how your company ensures data security during data exchange. You have the option to use free trials of different portals to get a feel for what does or does not work, looking for hosted or self-installed options. Make sure the technology integrates into both front-end and back-end applications, so security stretches from Outlook to your PLM system. Do research into the successful implementation of these portals into different kinds of companies, with individual needs from the portal. Protect your data before it leaves your enterprise. Getting it to your destination is only part of the equation.